ut-port-where-exactly-was.html ) Maddy, quoting the historian Ashin Das Gupta chipped in that Marco Polo did not mention Calicut by name, though he had visited Malabar. 'It appears that Yule added the 'unwarranted' comment about Calicut in the translation, according to Das Gupta', added Maddy. We set out to explore this question a little further – a journey that took us all the way to Venice and back! But, first, let us look at some ofthe available evidence. The picture given above is from the U.S. Library of Congress website. (http://www.loc.gov/wiseguide/jun06/polo.html ) The two portraits are those of Marco Polo and the Florentine humanist historian Poggio (1380-1459). What is striking about the picture is the inset which shows a busy port with lush greenery.The trees are supposed to be 'firs' meant for ship-building – Marco did not know then that the raw material for Malabar ships was Teak. Above the scene of the harbour is written the word “Calicu” which, the site thinks, is a reference to Calicut, India. 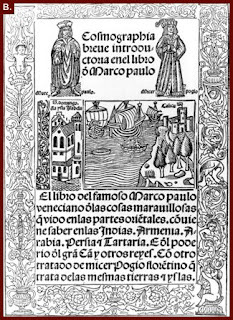 The illustration appears to be the front cover of a copy of the Travels of Marco Polo, of which several versions were available. In fact, the US Library of Congress itself has 125 different versions of the Travels in their collection. There is, however, not much difference in the details of Polo's sojourn in South India. He gives detailed description of Andamans, Coromandel coast, Mylapore and San Thome (in what came to be called Madras later), Masulipatnam, Tirunelveli, Kollam (Travancore), Cape Comorin, and Ezhimala (Deli). Then he launches into a general description of Malabar and the perils of piracy on this coast and we find him next on the Gujarat coast. This has prompted John Masefield who edited Marco's travels (1908) to comment: '...it is just possible that the description of these places were taken from the tales of pilots, and that his fleet put boldly out to avoid the coast pirates' ( of the western coast). Most probably Marco and company landed on the Coromandel shore and took the land route to Kollam. This conjecture might explain the vagueness of details about Calicut in a near-contemporary Chinese account highlighted recently by Maddy ( http://historicalleys.blogspot.com/ ) The Chinese account gives a lot of details about Kollam which must have been a flourishing port, exporting pepper, hemp, cloth, indigo etc. Coromandel coast was reputed to be the favourite landing place for horses and if the King of Kollam had been using horses, these must have landed on the eastern coast. The Kollam – Aryankavu- Shenkotta route to Tamil territory and Vijayanagar empire must have been the main land route. We repeat, all these are conjectures intended to provoke academic discussion by more knowledgeable persons! Our visit to Venice looking for traces of Marco Polo was a dampner. We looked in vain for more local information on the intrepid traveller from Venice. The great Venetian museum in San Marco extolled the glories of the Doges and the city state. Museo Correr was another ego trip for the Serenissima Republic. We even drew a blank in the cemetery outside the Church of San Lorenzo where Marco Polo was believed to have been laid to rest. No, the City seemed to have forgotten its eminent son who spent his life trying to convince his people that what he was narrating about the glorious Cathay was the truth. It would appear that Venice has not forgiven Marco for all the details provided by him which prompted a later generation of European adventurers to use his material and find a route to the east. Both Columbus and Vasco da Gama had used information from Marco Polo's travels. Their success led to the fall of Venice from the hub of European trade to a tourist spot touting gondola trips for the romantically inclined! Reason enough for the city to turn against the guy who caused it all! Interestingly the book Il millione itself was originally written in French by a romance author, Rustichello da Pisa, who was reportedly working from accounts which he had heard from Marco Polo while in prison in Genoa. Please accept my congratulations for the excellent rank this blog has received. Thanks to MR.Ramachandran. Thanks, Rajesh. One forgot about the Gan International and other airports of maldives. In fact, there is something common between Maldives and Venice - both are under threat of being submerged due to rising sea levels!